EINBREW Kontroller for HERMS / RIMS oppsett ølbrygging | Brewshop - Alt i utstyr til ølbrygging. Rask levering! Running your custom HERMS or RIMS electric brewery is easy with EINBREW 3V2P. Full management and temperature control for 3 vessels and 2 pumps. The 3V2P lets you program mash step temperatures and times as well as hop insertion times - it precisely controls the complete brewing process for you. Supports two heating elements of up to 15A each (consecutive use) and includes 2 x heating connectors, 2 x pump connectors and 3 x temperature probes and power input lead. 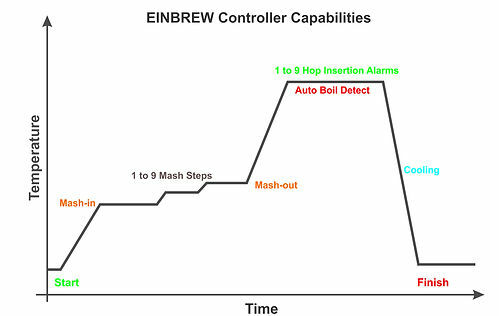 EINBREW EBC offers the best all-in-one control solution for 3-vessel brewing; everything you need to make the greatest beer around. Custom controller lets you setup your brewing recipe before you start, with support for up to 9 mash stages and 9 hop insertions. Compatible with wall or stand mounting so it can be placed at a convenient working height. Automatically controls to your set temperatures, and rests for the time you define. Custom control algorithm helps to prevent overshoot and oscillation. Temperatures and stages times can be adjusted on-the-fly when brewing, if you notice that things need to change. Also manages cooling stage. Includes a temperature measurement probe for each vessel (3 in total). Comes with all the mains plugs, x2 for the elements and x2 for the pumps.